NOTE I did a lot of work on this assignment just prior to sending for assessment and did not have time to take photos and update these blog pages. Please refer to physical submission for assessment and treat these pages as background only. Players of Greed West (8 items): Money Rush Background, Khashoggi, Colin Maxwell, Hugh Boughstead, Sam Cummings, Mohammed Al Tajir, John Eggleton, Margaret MacKay. Using a found book, significantly alter the appearance of the pages to create a volume that is personal to you. Approach the found book in a very physical way, manipulating the pages and paper inventively. If you need to, stitch or glue a number of pages together to reduce the ground you need to cover. Decide what to remove from the book, and what to add. Use the found book as a source of ideas and inspiration – the existing text may inspire illustrative or conceptual images. Embed, overlay and integrate your work into the existing pages using whatever materials, media and processes you feel necessary. This may be digital, hand-rendered, photography, textile, or a combination of all these and more. Apply an inventive, intuitive response to materials and how these can be exploited within the context of the altered book. 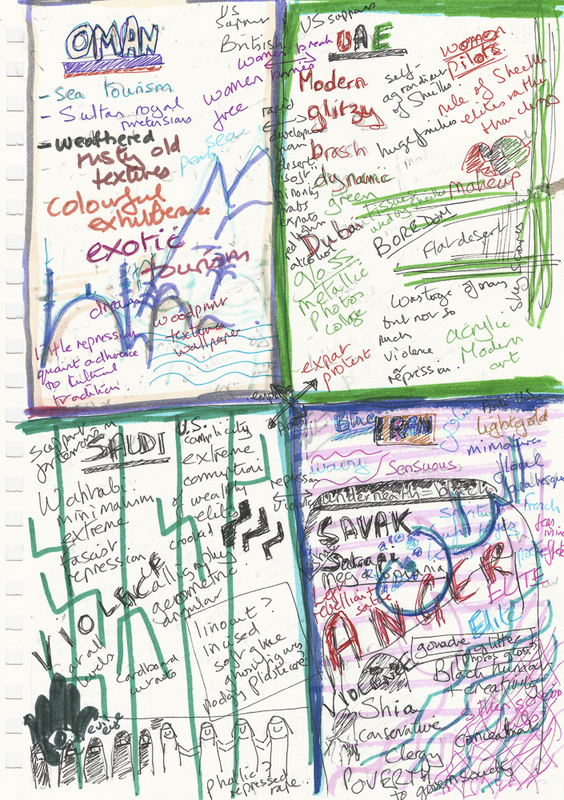 Refer to your contextual research into artists and designers on the course so far. Use elements of your research as inspiration and to inform your book-altering practice. I had spent a long time wandering around old book stalls in Cambridge market and Oxfam second-hand bookshelves since starting this course – in anticipation of this assignment. Initially I had found an old copy of Alvarez ‘Savage Mind’ and thought this might offer an interesting complement to the theme of ‘Identity’. But in the end I thought this might lead to too dark a place – and used parts of it instead to test out interactions between different types of paint, ink and inkjet printing on book paper mock-ups, and also for the earlier parts of Assignment 4 : Anonymous. 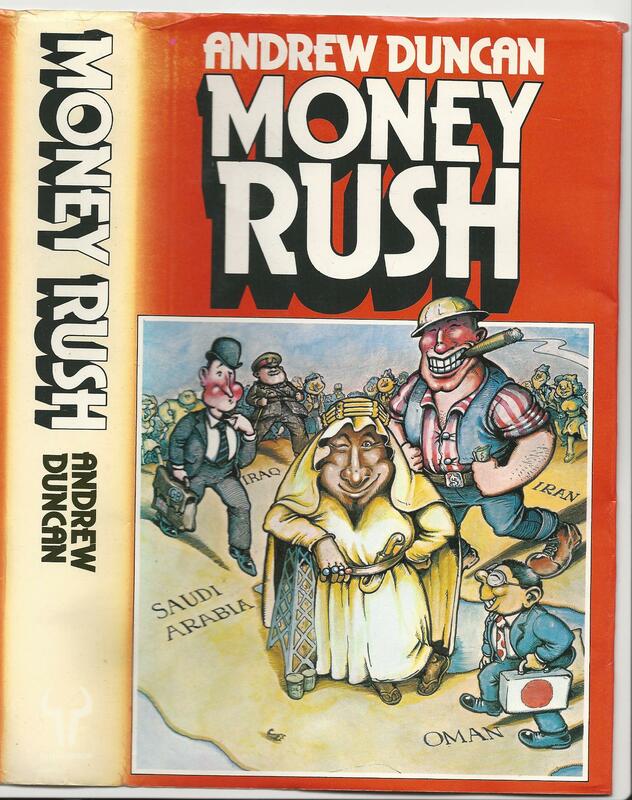 I chose instead another book I had found in Oxfam about the impact of discovery of oil in the Middle East in 1970s: ‘Money Rush’ by Andrew Duncan and published in 1979 by The Anchor Press Ltd. The book was quite topical in view of the later effects on Western/Middle East perceptions and relations as later played out in Iraq, Libya and Syria that were graphically documented on Al Jazeera. When I bought the book the Daily Mail was covered with images of Islamic women terrorists, and there were many discussions on BBC of why British women and men were becoming radicalised. The book also covered a period in Iran which I had personally witnessed – a period when our self-interested promotion of the Shah and his SAVAK secret police fuelled support for the rise of the Ayatollahs and stifling of any democratic resistance in Iran. A fact that journalists in Pakistan and Afghanistan later mentioned to me as a reason why they felt support for Osama Bin Laden. So I felt that this book would give me a lot of interesting material to explore and work with – looking somewhat critically at Duncan’s analysis and linking the events of the 1970s to current Middle East/West relations. Something that is important background to much of my professional work. I also saw it as offering me the opportunity to explore in much more detail traditional and modern Islamic design – a longstanding interest of mine. At the same time, because of all the many interesting possibilities, I was concerned to see how I could do justice to all the many ideas I had in the short time available for the project. As I read the book in detail, with its really bizarre stories of corruption, greed and lethargy, I started to envisage a board game – like Monopoly – and after some searching on the web I came across a series of board games called ‘Petropolis’ used by oil companies to train staff. I did some research into different versions of the game, and brainstormed through a mindmap about how I might design an adaptation that would raise questions about Oil Politics and Power, rather than just making money from oil. As I progressed with the overall design and more in-depth reading of the book itself and research started to clarify the content. I had wanted to link the events and motivations of both Western powers and Middle Eastern players to current events in the Middle East and the growth of terrorism. But actually the issues raised by the book are relevant not only for the Middle East, but the links between money and global power more generally. So although the overall design and style is Islamic, I changed the name to ‘the Greed Game’ – the main implication will be in the way I design the Rule Book, player ‘Business Cards’ and the portrayal of the ‘Allies’ and ‘Telex Cards’ (see below) to raise more general issues as the game plays out. I decided the game would use only, and all, parts of the physical book. The existing book cover would be a folding board to wrap around the game contents. The pages would then be used as information cards and booklets, painted over to paint, draw, print, collage on other information, cut up and printed as money or as pop-up assets (I am getting interested in kirigami). Spare pages would be recycled as handmade paper for the Telex cards.d as papier mache. The only real addition might be some cloth/black plastic?? attached to the cover to make the pockets pockets for the contents, probably on card to stiffen them, and a cord to wrap the Box closed. GameBox folded around all contents and bound with an Arab Headband? Outside View has pockets stitched to contain all the Background and Ally Cards for each country. Black Background and opens Arabic Way. Inside View is Red with Pockets for the Player Cards, Telex Cards, Intro Card and Rule Book. Ally cards: key actors who can be influenced/bought in each country from the characters in the book pages. Money – in denominations of thousands and billions of USD and local currency. There are not enough spare pages to recycle for this, so I am planning to use the many old pill plastic covers lying around our house – a reminder of what the money could have been spent on if it had not been frittered away (even where it did not do actual serious harm). I focused first on getting to grips with the book content in order to focus my background research on what is a very big topic. I started by dissecting the book into sections that were manageable, and also to break its ‘sanctity’ and any fear of ‘messing it up’. As I worked through each section I researched topics that were relevant, focussing on areas that are of most interest to me in terms of future directions I might want to take my visual communications work. In my visual communications work in general I want to focus at least partly on political and social themes that I feel strongly about – to learn to communicate these in a way that can bring other people along with me as opposed to bashing them over the head with blunt messages or tiring them with compassion fatigue. This means in-depth understanding of the complexities of issues. I studied Persian and some Arabic for part of my BA degree and so have long had an interest in Islamic art and culture, both traditional and also radical traditions of protest. Part of my model for this is the work of Dan Eldon explored earlier in the course, and some modern Islamic artists and illustrators like Marjam Satrapi, Shirin Neshat, The Little Black Fish and other artists from Middle East. 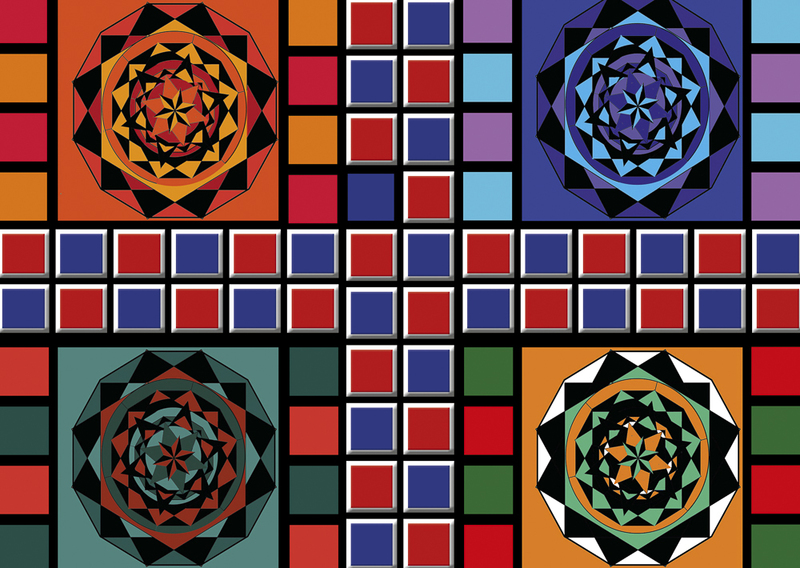 I experimented with colours and traditional geometric designs as well as modern styles, combining this with research on printing and papers that I might use. Printing on Fabric – possible designs for the front pockets of the cover. NOTE: the two countries I have worked on most so far with developed pages are Oman and UAE (including some allies). Iran I have done a developed digital mockup. Saudi Arabia work is only very preliminary at this stage. I read through the dissected book sections and scanned the pages and pasted these into InDesign files for the different Game contents above – as I would be able to use some of the pages directly, other information I would need to reprint on unused spare pages with some sort of painting over the original print. I then started the rather scary process of going through the actual pages – highlighting the key information in a relevant colour, and painting over information that was not relevant, and reprinting other information needed to complete the booklet. Alongside this I developed a sketchbook from videos and other Internet materials like photographs and design examples from the country, as well as ideas from imagination, and experimented with materials and papers – building on my experiments earlier in this part of the course. The contents of the book were presented in an entertaining and interesting way. Much of the responsibility for the corruption and waste attributed to Western traders and their ‘Lawrence of Arabia’ attitude and/or downright unscrupulous greed and/or the (competing) vested interests of their governments. However in the light of my other reading it was clear that some of the discussion was inevitably oversimplified. Particularly in the case of Oman and UAE the predictions of collapse and repression were to a large extent unfounded – though there was/is certainly a lot of waste and exploitation. A key issue was to decide how to clearly differentiate the styles for each type of content, and the background booklets – and to tread a very thin line between ‘cultural sensitivity’ and stereotype. I did some initial brainstorming on design – which colours and techniques to use to meaningfully distinguish the different countries and visually communicate the differences between them – the more I researched into the countries the more the differences were apparent. I progressively developed mindmaps for each country, with different colours, shape dynamics and material techniques. When I come to finalise this project after a break and feedback, I am planning a review of everything I have so far as Moodboards to firm up these designs and get ideas for the rest of the allies and contents that do not just repeat what I already have. Ally cards: in each country there are key actors who can be influenced/bought to assist the players. These are 1-2 page booklets in a similar style to the country. But the idea is they could also influence other countries and change allegiance – at a price. All the allies are up for auction at a negotiated price – depending on their money/ethical track record and power status. Allies are decided, bought sold and negotiated by the players as they go along – using the information on the cards to persuade the others to part with cash, or enhance/risk their reputation by association. The background booklets are 12-20 pages long. Mostly bound by laminating with matt or gloss laminating pockets depending on the effect I want. But some of the older pages I want to maintain fragility and will bind through gluing thin strips of cloth for the spreads (these would be consecutive pages. The booklet spreads will then be stitched. They will open the Arabic way. Iran research page (forthcoming) this will include discussion of the radical movements that were going on at the time of the shah – not supported by the British or Americans. Including the women’s movement. And the recent ‘men in burkha protest movement’. Oman is a relatively peaceful country, proud of its cultural past and developing a tourist industry. Before the current Sultan Qaboos, the British controlled Oman and supported very cruel tyrants in their concern to protect their access to India and the Persian Gulf. Although lots of money was wasted by Sultan Qaboos who is lambasted in the book, there seems to be little political repression and Omani women have a lot of freedom. The main concern is what will happen when Qaboos dies – he has no heir, nor has he groomed a clear successor, or set up a strong democratic system. Saudi Arabia is really barbaric and propped up by US interests. There seems to be little in the way of more progressive culture like the protest movements in Iran, or the opening up in UAE and Oman. The elite family is corrupt and hypocritical with millionaire lifestyles. There are though currently some glimmerings of change – though the most recent King has committed human rights abuses. Black, white and green of Wahabi Islam. Some red as ‘forbidden’ colour. Linocut, paper cut and maybe some podgy plasticene for the effete royal family. UAE has been cobbled together by colonial powers from 7 emirates that find it quite problematic to work together, because of historic rivalries. MKuch of what has been built has risen out of the desert because of a wish for self-aggrandisement by sheikhs like Sheikh Zayed. Sheikh Rashid of Dubai is however more progressive and visionary. Nevertheless there has been considerable and development and progress that is likely to continue and gradually democratise. The situation for women is quite conservative, but there are women airplane pilots and entrepreneurs coming up. The main issue seems to be the human rights of immigrant workers and an almost apartheidt system. Red, Green, Black and White from the flag. Horizontals of the desert and verticals of sky-scrapers. Collage, tissue (the sheikhs seem to always have coloured tissues at hand), wallpaper textures. the colours – I need to redo the country colours on the original illustrator files to match what I have done on the Background booklets. exactly how the players will move around the board. The players move along the red and blue ‘colonial squares’ from their respective starting points (to be decided still – should there be ‘airports?’). But I am not sure how the blue and red squares will link to the country squares. There needs to be some link across the top, probably all across. put on the pointers for the telex cards – eg should they be on the blue squares? or randomly assigned squares, and how frequent should these be. I need to do some dice maths and look again at Monopoly. do players choose which way to go – a bit more light drafts? or are there specified routes? Each country has a number of specific squares that have different instructions eg you are caught by the secret police, you win a big contract etc or you have to convince a key player to let you leave etc. Then there are linking squares along the trade routes: collect x amount of money, you have a conflict with x – you must negotiate and pay them off, you are diverted to x and have to make alliances to get out and so on. Some are also particular contract cards that can be taken up or traded. Main issue, background and Rules and table showing initial money and ethical starting point for each player and ally. Establishing the player identities: Players roll the two dice and are allocated one business identity card and token from the 12 possible business identities. They receive (or have to share) a copy of the Country Profile. The put their token on the relevant starting country on the board. Dealing the starting money: the money cards are shuffled and each player is dealt at random 5 money cards (these will be of significantly different amounts, and some may not be in a currency used in their country). Ally Cards: the ally cards are shuffled and half are randomly distributed between the players (not all necessarily receive the same number – depending on number of players). STAGE 1: Initial trading of allies – players read the information they are given and, based on their character, they decide on any ethical rules they will try to follow. Based on the ethical score-card given in the Player Booklet, their money will be multiplied according to the ethical rules they establish at the beginning if they manage not to break them. Based on their amount of money, ethics and country they make some decisions on which of their allies they want to keep, and which ones they will aim to trade. STAGE 2: Main game – players roll one of the two dice and move around the board – landing on the squares and following any telex or other instructions associated with each square. Some of these involve business opportunities and negotiation/buying/selling of allies and/or business contracts owned by others. This can be timebound – minimum 2 hours. STAGE 3: Final assessment – who wins and who loses – assessed by the final amount of money, multiplied by any ethical rules they have managed to follow. Each player has to justify and explain their ethical claims to the others – in case of disagreement the other players vote to decide. 12? business players are profiled in a 2 page bland (grey/brown gouache with caricatures) identity booklet with an associated identity token. These players are not initially equally distributed between countries, but players can decide to relocate, or maybe relocated through telex cards. Each player selects one identity at random from the pile. Player business identity cards that are not assigned are put on one side as competitors and referred to in the telex cards? or added to the pile of allies??? business deal cards that can be bought and sold to other players eg for hospitals, railways etc, arms deals. others are risks: ‘discovered by secret police’, ‘Family cannot stand it any more. Negotiate a move to a more interesting location (eg Oman or Dubai). Or go home – you are out of the game’. In denominations of thousands and billions of USD and local currency. There are not enough spare pages to recycle for this, so I am planning to use the many old pill plastic covers lying around our house – a reminder of what the money could have been spent on if it had not been frittered away (even where it did not do actual serious harm). NOTE: I need to sort out how to position the prints exactly on the page. My two inkjet printers have very different drivers. There are also issues between Adobe instructions and driver instructions. Even if I put in precise measurements, and a bleed, I have not yet been able to position images exactly where I want them – any advice on this welcome. Or is this inevitably going to be problematic?